Two dollars won't get you very far in this modern world of ours. A small cup of joe... A McDouble and a small fry... Well, now that very same two bones can net you a fully-featured, highly approachable music sequencer. Cinemax (?) has given us Rytmik Rock Edition, and it is good. Figure 1 - Clip. Behold, the world's smallest piano. What kind of person could play it? 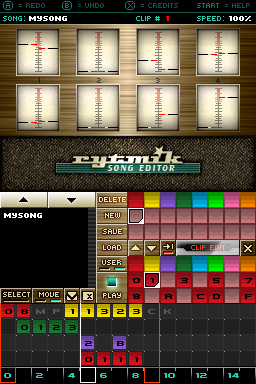 Quality music sequencers are always clean, wholesome fun for novices and experienced musicians alike, and Rytmik Rock Edition, boasting even more functionality than its 800-point predecessor, the techno-based Rytmik, does not disappoint. The virtual buttons are tiny (make sure to have your stylus handy), but the interface is clean and logical, to the point of not even needing a manual. Each song is constructed from a slew of color-coded 16-beat clips (see Fig. 1) which are layered upon a grid (see Fig. 2). Each clip (see Fig... you get the idea) can have four separate monophonic instrument tracks, and the grid allows for up to four clips to be used at once, so you should have more than enough tools to create the rock opus that you've always dreamt of. Figure 1 - Grid. It's like a musical version of Mastermind! 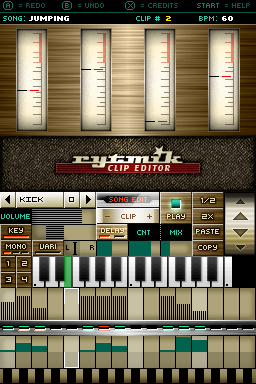 Each clip also offers a surpisng degree of control, including functions like panning, per-note volume control, and simple reverb and delay. There are limitations, of course, but it's truly amazing to see (and hear) how much Cinemax has squeezed out of the DSi hardware. The rock-oriented slant of the samples (a variety of standard drum, bass, guitar, and keyboard sounds) is refreshing, but it should be said that the distorted guitar chord sounds are as unconvincing in Rytmik Rock as they are in most other synthesized representations. You'll have better luck making a chord manually from three different lead tracks. Other than that nitpick, though, the sample quality is pretty decent, overall, especially considering the digital footprint that Cinemax had to work with. It also would have been nice to have the ability to somehow export the MIDI files or the audio data (without the aid of a headphone jack). Still, Rytmik Rock is more of a compositional toy or musical sketchpad than a professional sequencing application, so the absence of these features is understandable. I could go on, but, really, what I want to communicate to you can be summed up in three words: Download this title. Put down the McDouble and pick up Rytmik Rock Edition. Your body will thank you, and so will your brain. If you have four bucks, you can get both, though. I can get a McDouble for two bucks!? Later! Nah, changed my mind. Like you said, my body is ready. And it thanks me. Hey, this 'game' (or app?) sounds pretty cool. I like those music tracks you posted as well. I don't know much about making music other than what I've dabbled with in Mario Paint, Electroplankton, and... that's it, I think. But it would seem fun to experiment, even if I don't have a music talent at allll. Damn I really want a McDouble now... wish McDs delivered. Anyway. I love music apps... I may pick this up, although I already have the Korg DS-10 for all my handheld sequencing needs. Thank you for your charity! I have the Korg DS-10 cart, but I've never opened it. Haha, what's wrong with me? A McDouble is actually ONE dollar. The Small Fry (hoy!) is another. (And two Baked Apple Pies could round out your meal for a third.) It's a crazy good deal. And it tastes good, too. But it sure ain't good FOR you. It's pretty fascinating how Mickey D's and others like it control the prices of things like beef and chicken and potatoes to offer food at such a low rate. I mean, that's far cheaper than the groceries to cook a meal. Anyway, RoyEric, if you can make music in Mario Paint, you can make music in this. Because Mario Paint is a sequencer. You'd be surprised at how easy it is to come up with something decent sounding in a sequencer. You can just plop random dots on the pattern and the repetition will make it sound like something. Or you can go deeper, if you want. It's fun! Is musical talent a thing? It might be that anyone can do it, as long as they think they can. When you listen to music your whole life, I kind of think it all blends together inside you. You know, inside your soul. Aw, sweet, so that helps me understand a sequencer better, didn't realize it was so similar to Mario Paint in that regard. 'Hoy, small fry, I have to get The Small Fry on name alone. That kind of cheap, unhealthy food obviously contributes to the American obesity problem. Oh yeah, I remember that discussion in the community thread a while back. It's easier to be healthy when you can afford to do so. Unfortunate. 'RoyEric'... haha, a lazy blending of me and my alter ego. Much appreciated! Actually, Royric would have been better. Eroy? Yeah, poor people can get way more value for their dollar at Mickey D's than at the grocery store. Especially these days. Grocery prices are crazy! I edited some pics in to clarify what a music sequencer is. There you go! A couple of screenshots does make a big difference, believe it or not. Good recommendation, Anand. I've been playing around with it and it's worth 2 bucks easy. Guillaume should use a few of our compositions on a podcast someday. Cool. Did you make some mad tracks? Post 'em! Yeah, I'm just lazy. Those screens look kind of confusing, but it's actually really easy to use. All I've made so far are just random screw-around sketches. But I'll try to come up with something worth posting over the next couple of days. Both of you guys play music, though. Having no kind of idea where to begin, I'm not sure I would oh what the heck two bucks. Every time I read your post I see more words! Brain trickery. I have KORG and never used it, so I'm reluctant to try another piece of software.... I'll just listen to you guys' creations instead, haha. Hmm, maybe I'll buy this and put something together on the train ride home. Except that was supposed to be Ghost Trick time.